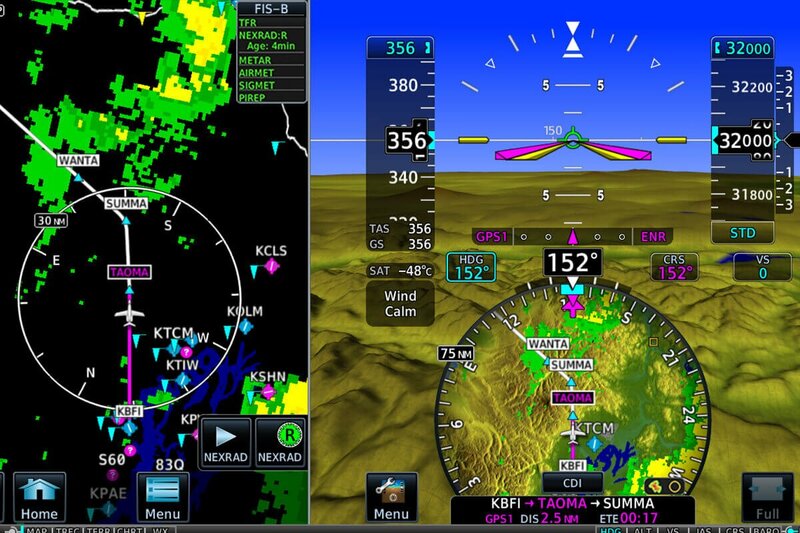 Garmin TXi™ puts a revolution in flight technology at your fingertips. 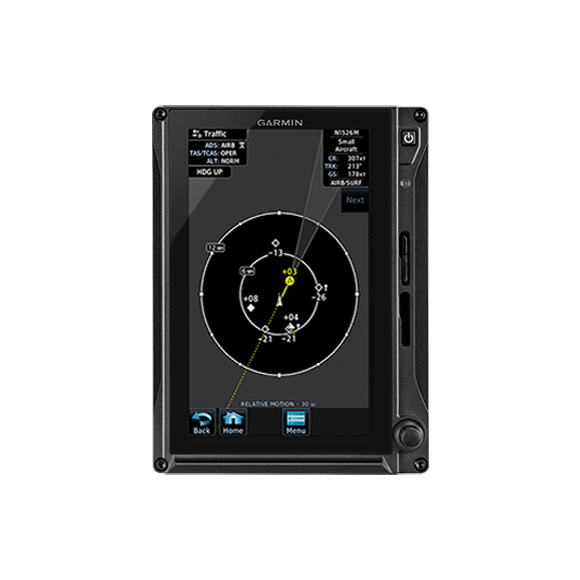 With these clean-sheet TXi designs, Garmin has created a smart, scalable way to upgrade your aircraft and help improve the safety of each flight. From a single display to a full-suite installation comprising up to 4 displays in your panel, the modular building block concept of the TXi series supports an impressive array of PFD/MFD/EIS functions and formats. So it’s easy to scale a system that perfectly fits your panel, your mission and your price range. 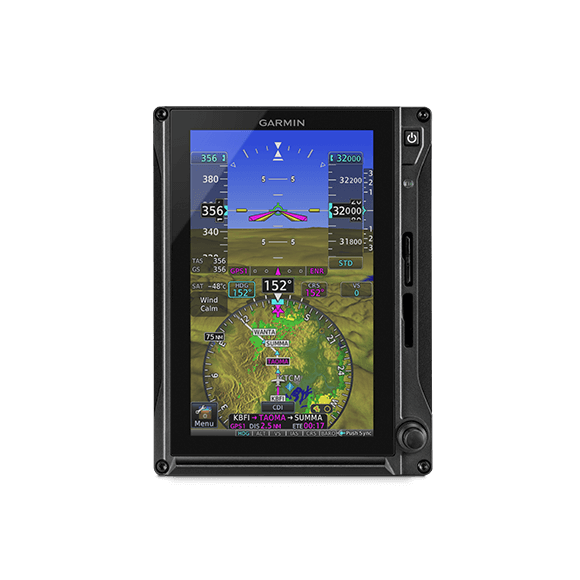 Combining the latest in electronic glass cockpit instrumentation with touchscreen interface and safety-enhancing features, the Garmin TXi™ series brings new levels of reliability, adaptability and affordability to helicopter operations. Bright LCD displays, available in 7" or 10.6" formats, offer a variety of installation configurations to fit your panel space, your price range and your mission requirements. 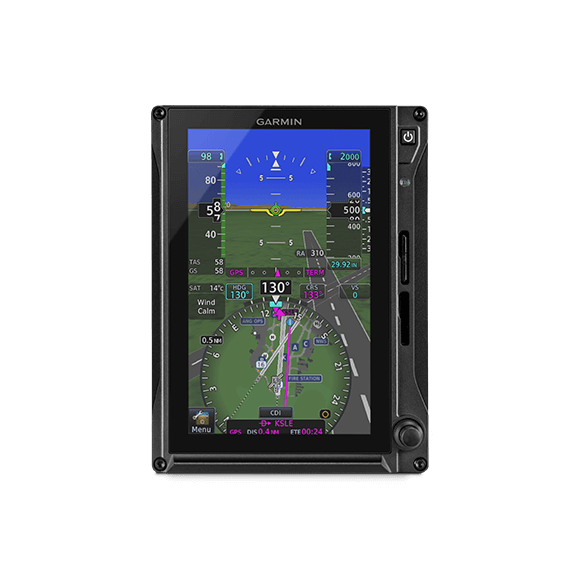 Garmin TXi is the glass flight display upgrade solution that makes it easy, practical and cost-effective for aircraft operators to extend the operational life and viability of their existing equipment. 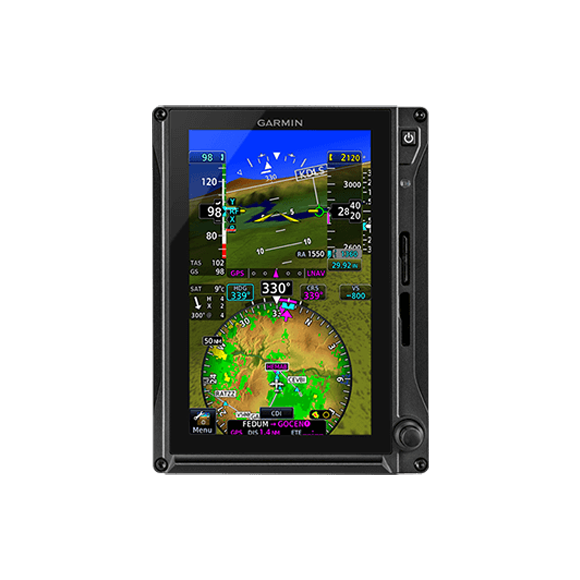 TXi touchscreen flight displays integrate with the GTN™ 750/650 series flight management system (FMS) to provide navigation, communication and an impressive array of PFD/MFD capabilities. This TXi/GTN pairing is certifiable for WAAS LPV and Reduced Vertical Separation Minimum (RVSM) operations. With TXi, solid-state sensors provide maximum levels of performance and reliability while reducing overall system weight, maintenance and life cycle cost of ownership. This versatile display can be used in a variety of configurations to fit your panel space and avionics budget. It can serve as part of a multidisplay system or as a dedicated stand-alone PFD, MFD or EIS display. 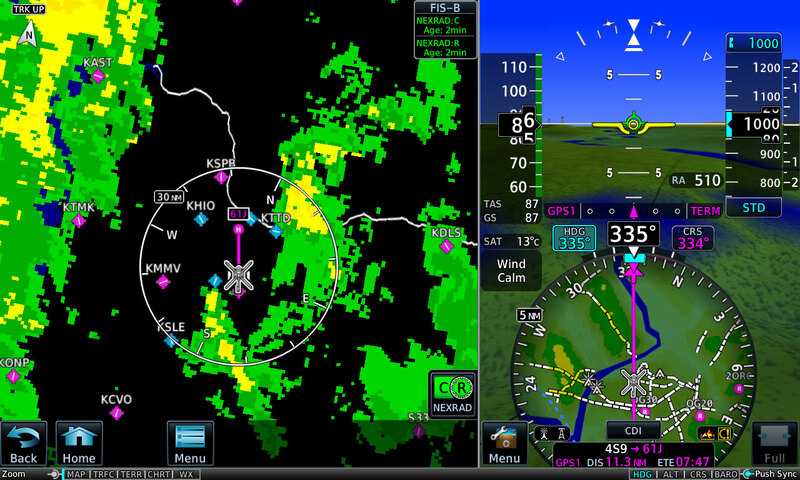 Plus, for single-engine piston aircraft, there’s a combined EIS/MFD split-screen configuration with detailed moving map display. 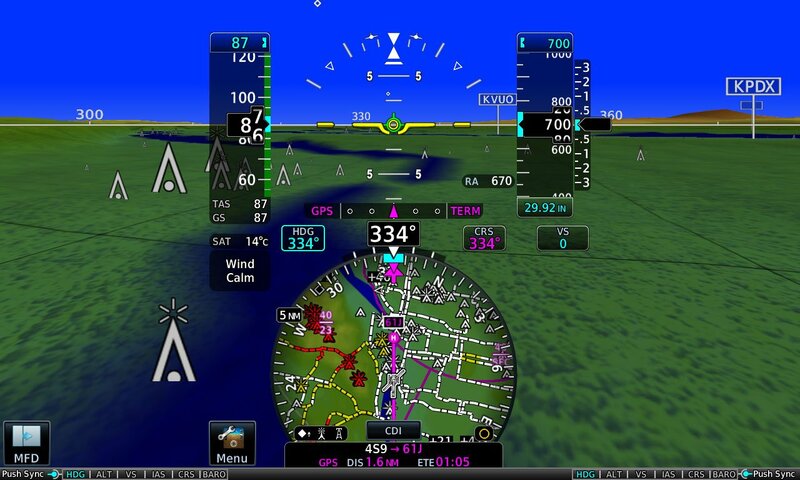 The PFD format includes an HSI mapping feature, allowing an MFD-like perspective map display to be viewed together with directional and attitude information. Providing a stand-alone or multidisplay option where panel space may be limited, the 7” landscape format brings additional flexibility to the TXi flight display lineup. 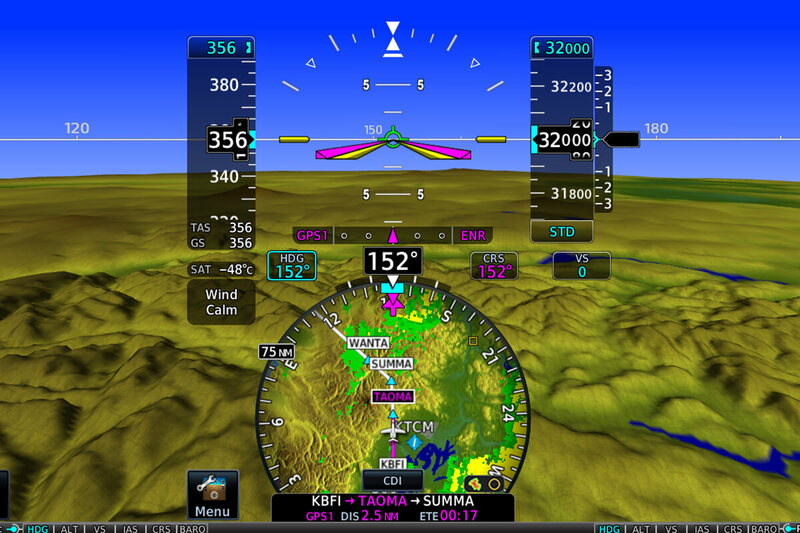 As a dedicated PFD, this format can display instrument tapes, a half-arc HSI and available Garmin SVT™ 3-D synthetic vision technology. It can also function as a stand-alone EIS display for engine and fuel-monitoring data. 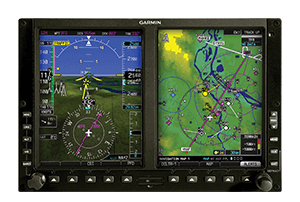 Plus, for single-engine piston aircraft, there’s a combined EIS/MFD split-screen configuration with detailed moving map display. 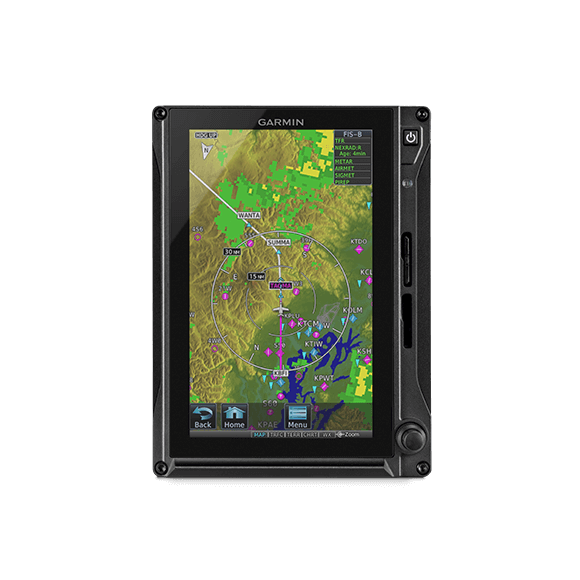 Leveraging industry-leading integrated cockpit technology, the large 10.6" TXi series touchscreen for helicopters can accommodate primary flight display (PFD) information and multifunction display (MFD) capabilities — all in 1 split-screen format. 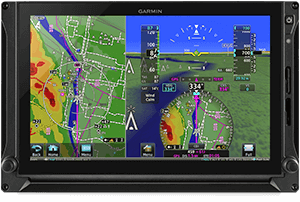 For added versatility, the display is pilot-selectable to a full-screen PFD presentation to allow more room for our optional Garmin HSVT™ 3-D synthetic vision technology. 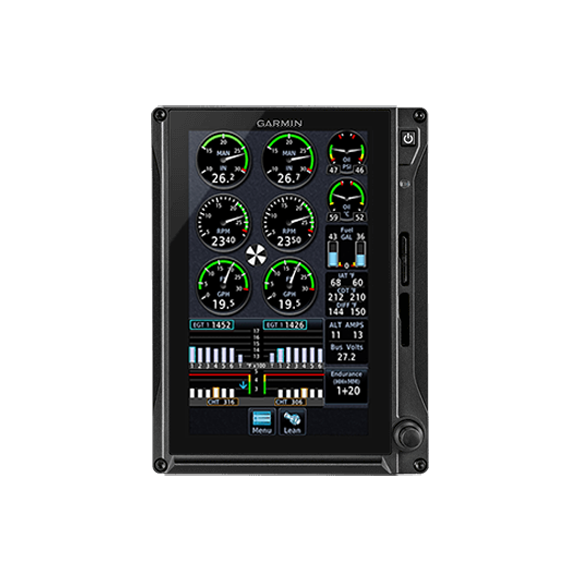 For helicopter installations, this versatile display can be used in a variety of configurations to fit your panel space and avionics budget. It can serve as part of a multidisplay system or as a dedicated stand-alone PFD or MFD display. 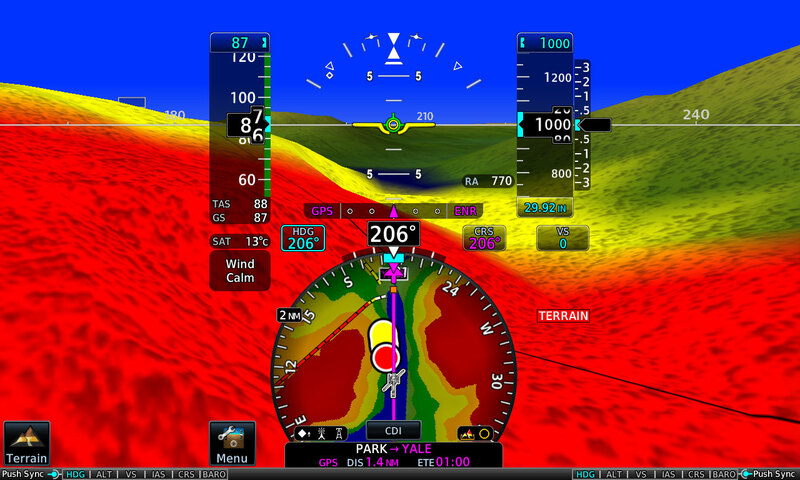 The PFD includes an HSI mapping feature, allowing an MFD-like perspective map display to be viewed together with directional and attitude information. 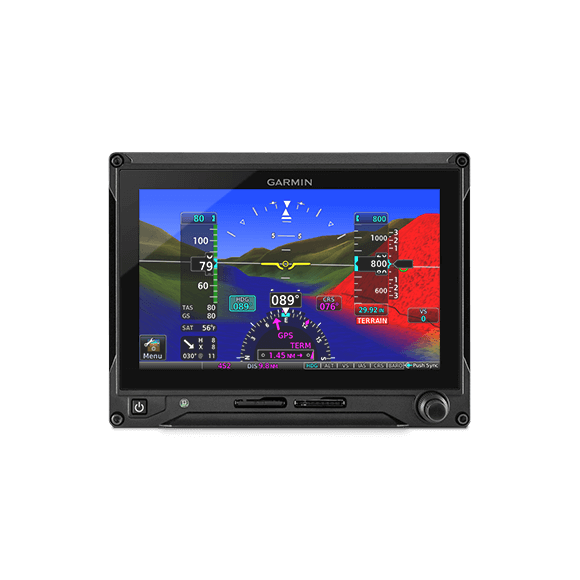 As an option for helicopters where panel space is limited, the TXi 7" landscape format can serve as a dedicated PFD with instrument tapes, a half-arc HSI (without the HSI mapping feature) and optional Garmin HSVT™ 3-D synthetic vision. Using sophisticated computer modeling from the system's terrain database, HSVT gives helicopter pilots a clear perspective view of ground and water features, airports, obstacles, traffic and more. 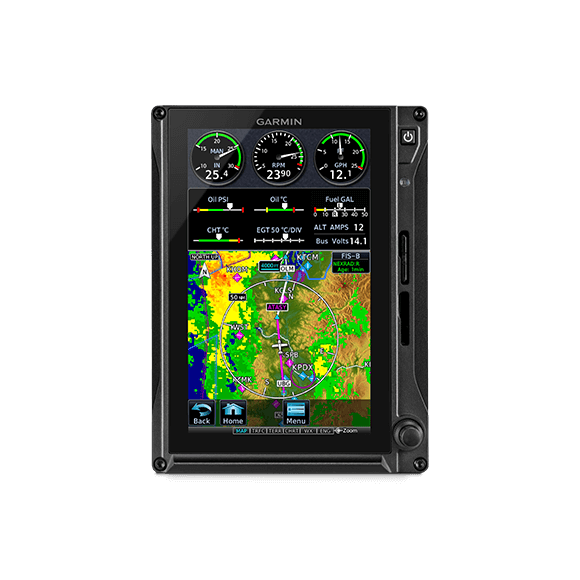 Leveraging industry-leading integrated cockpit technology, the large 10.6” TXi series touchscreen allows a pilot to select either a full-screen PFD format or split-screen PFD/MFD format. The software is certified to Level A requirements for business and commercial applications. This versatile display can be used in a variety of configurations to fit available panel space. It can serve as part of a multidisplay system or as a dedicated stand-alone PFD or MFD. The software is certified to Level A requirements for business and commercial applications. 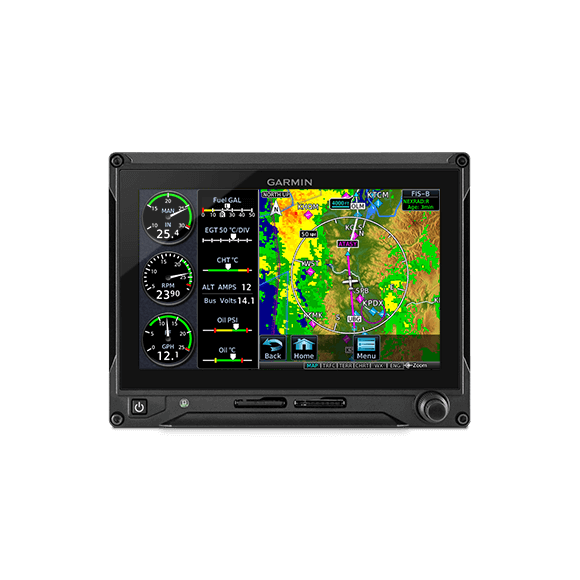 Providing a stand-alone or multidisplay display option where panel space may be limited, the 7” landscape format can serve as a dedicated PFD with instrument tapes, a half-arc HSI and Garmin SVT™ synthetic vision. The software is certified to Level A requirements for business and commercial applications. 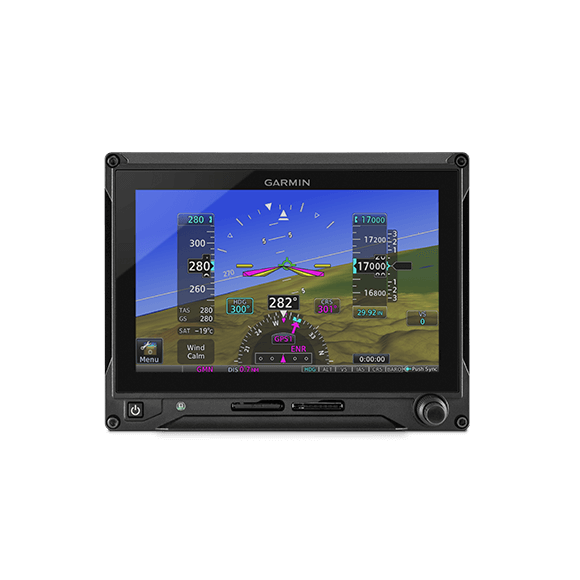 For owners of original G500/G600 flight displays who want to move up to the latest and best, full TXi compatibility with existing system sensors makes for an easy, cost-effective replacement/upgrade path. 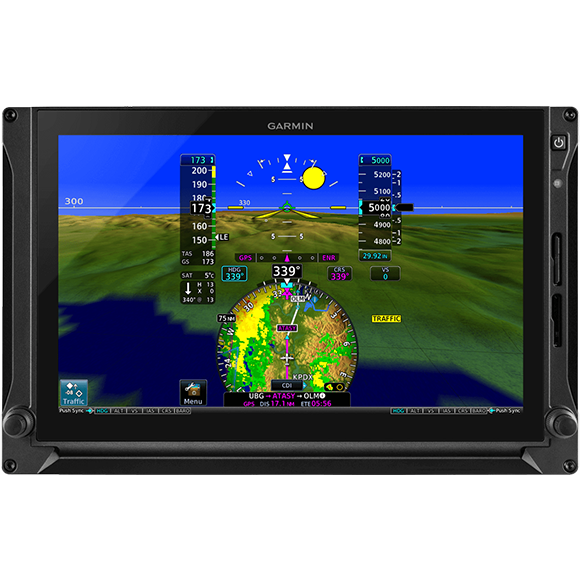 The Garmin TXi touchscreen flight displays are optionally available with NVG compatibility while also providing crisp, vivid display readability under all ambient lighting conditions — from hard dark to bright sunlight. As a growth function — when paired with compatible equipment — select TXi displays will support TCAS II technology, which offers traffic resolution advisories (RAs) in addition to aural and visual intruder warnings. 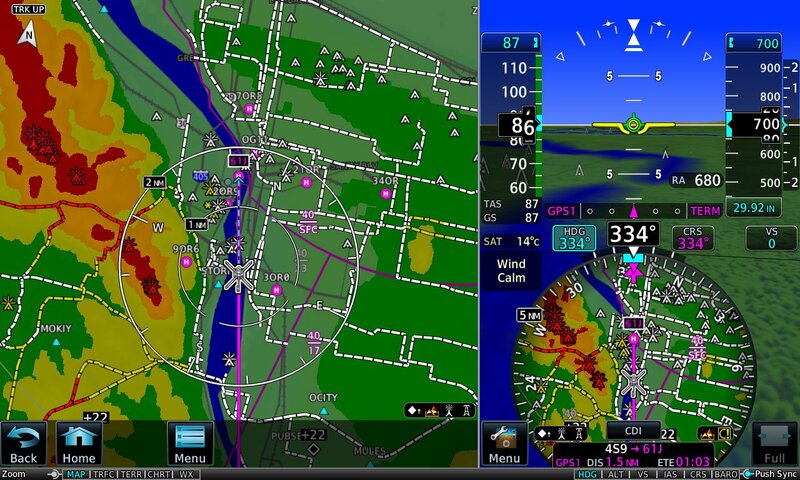 The system’s flexible configuration options, familiar user interface and best-in-class graphical display capabilities enable pilots to access and process more high-value flight information at a glance. 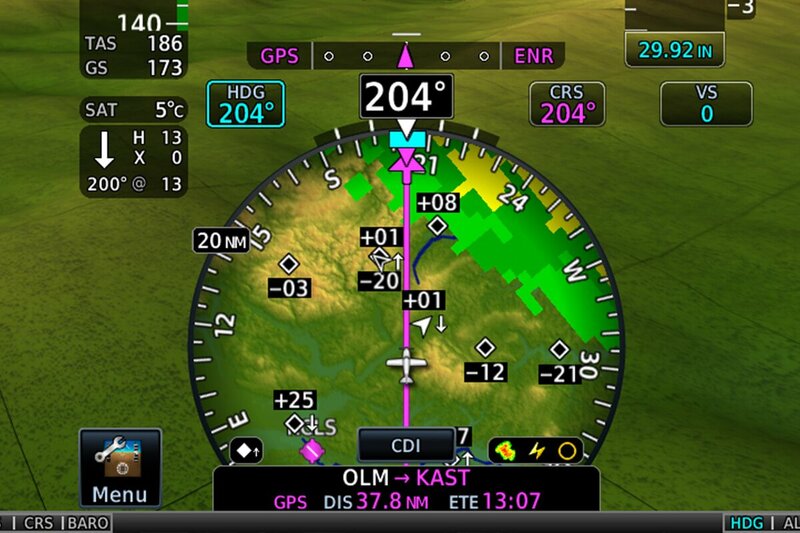 With this leap forward in technology, the Garmin TXi family puts more navigation confidence at your fingertips. 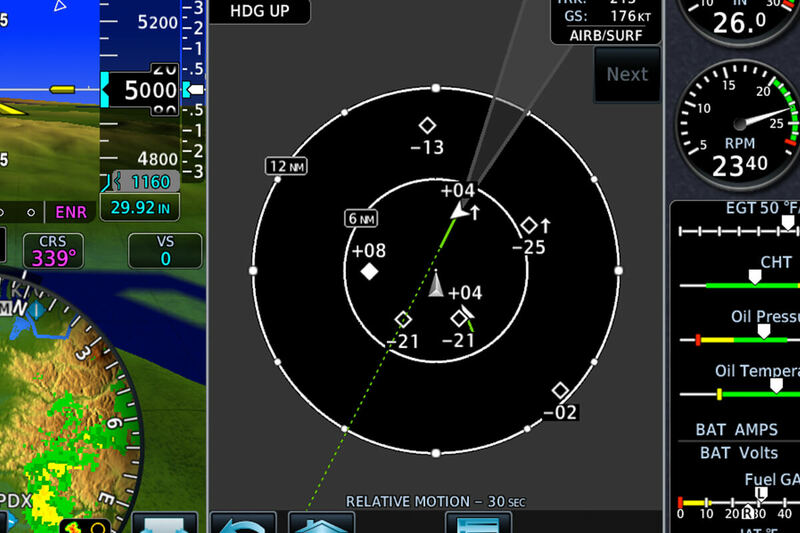 An MFD in Your HSI With navigation inputs, the TXI series can put an MFD-like perspective map view within the HSI portion of your primary flight display. This HSI map can incorporate NEXRAD imagery and weather data as well as SafeTaxi® diagrams, traffic, terrain alerting and more. 3-dimensional SVT Available SVT synthetic vision uses sophisticated graphics modeling to provide a virtual reality perspective of terrain and water features, obstacles, runways, traffic targets, flight path information and more. Dynamic Mapping TXi dynamically draws moving maps with airspace boundaries, navaids, flight plan routings and more, overlaying the aircraft’s position on top so it’s easy to understand what matters most. Georeferenced FliteCharts®, SafeTaxi diagrams and optional Jeppesen®-format ChartView™ approach charts are also available. 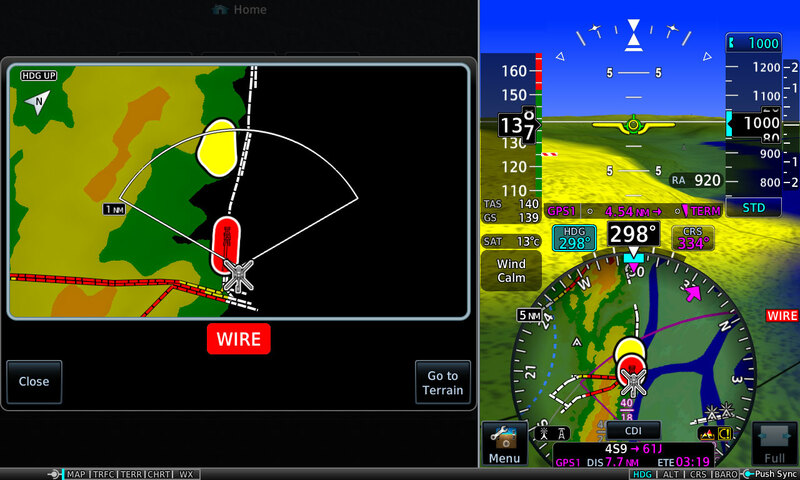 Track Weather Wherever A wide range of available weather solutions can be displayed on your TXi series touchscreens — everything from onboard digital radar to Stormscope® lightning detection to animated NEXRAD imagery from various satellite or ADS-B ground network links. Advanced Traffic Display TXi displays will integrate with a variety of traffic alerting technologies — everything from ADS-B “In” network traffic links with TerminalTraffic™ airport surface monitoring to our patented TargetTrend™ relative motion technology and active traffic surveillance systems. Engine Information System (EIS) Offering a choice of stand-alone or integrated instrumentation formats, TXi displays help take the guesswork out of engine, fuel and electrical system monitoring. 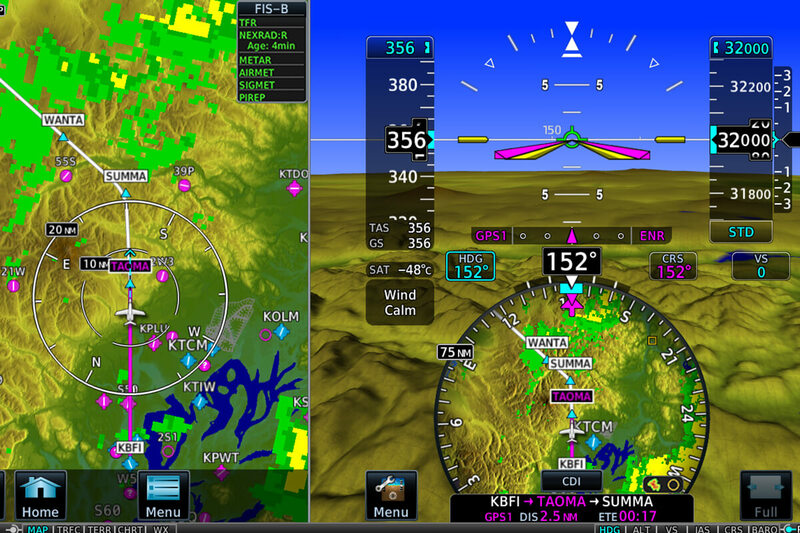 Prominent gauges on the display support real-time lean assist mode, pilot advisories and more. 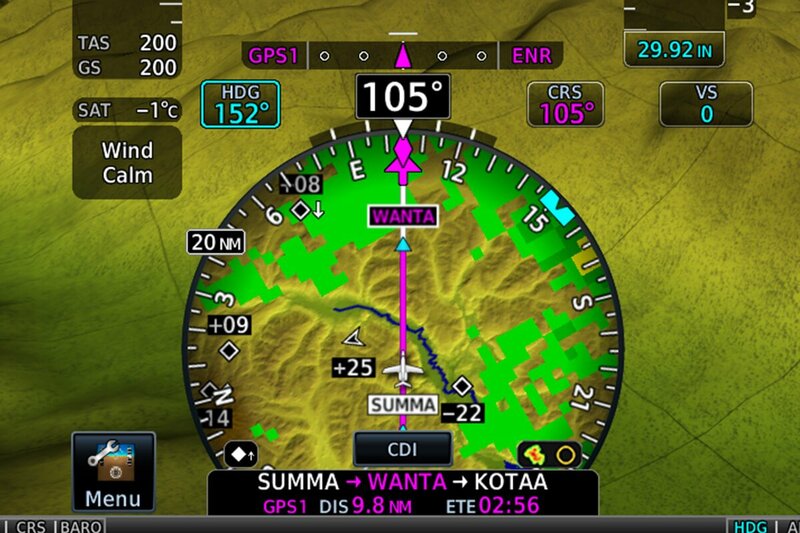 VNAV with Vertical Profile Guidance When paired with our GTN™ 650/750 series navigators, the TXi displays will support descent vertical navigation (VNAV) with vertical profile guidance via automatic or pilot-selected altitude constraints at waypoints in the active flight plan. 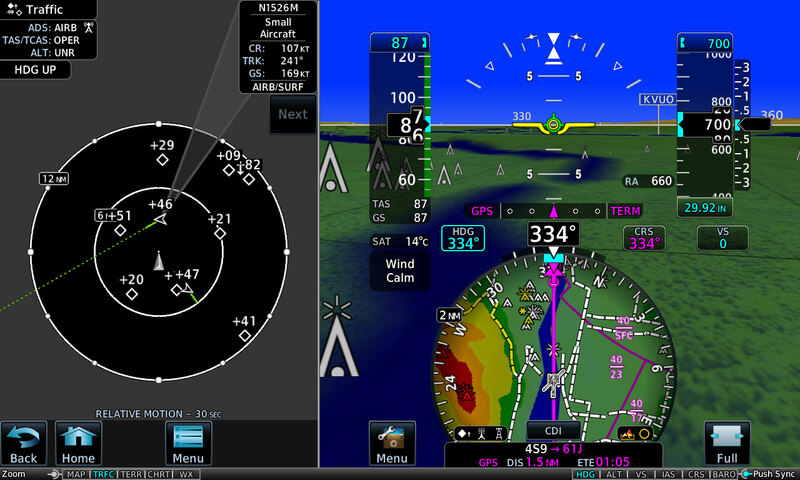 An MFD in Your HSI With navigation inputs, the TXi series can put an MFD-like perspective map view within the HSI portion of your primary flight display. * This HSI map can incorporate NEXRAD imagery and weather data as well as SafeTaxi® diagrams, traffic, terrain alerting, wires and more. 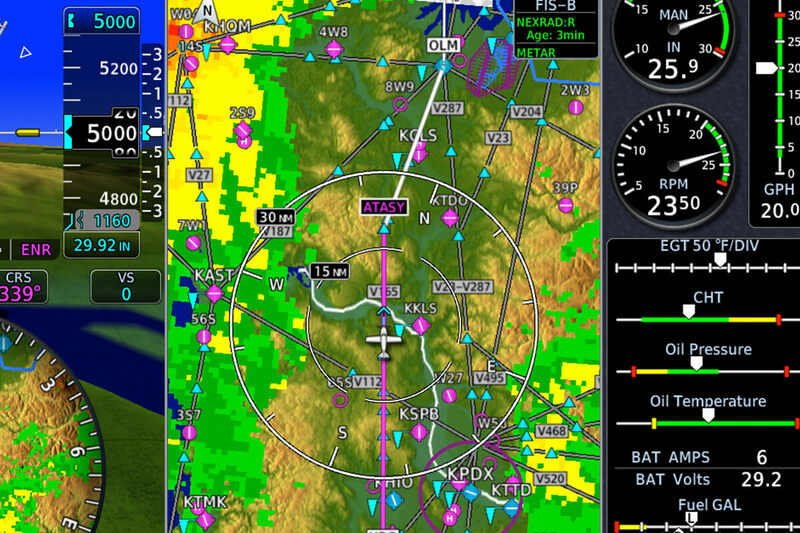 NOTE: 7" landscape PFD format for helicopters does not offer HSI map feature. 3-dimensional HSVT Available HSVT synthetic vision uses sophisticated graphics modeling to provide a virtual reality perspective of terrain and water features, obstacles, runways, traffic targets, flight path information and more. Dynamic Mapping TXi dynamically draws moving maps with airspace boundaries, navaids, flight plan routings and more, overlaying the aircraft’s position on top so it’s easy to understand what matters most. Georeferenced FliteCharts®, SafeTaxi® diagrams and optional Jeppesen®-format ChartView™ approach charts are also available. 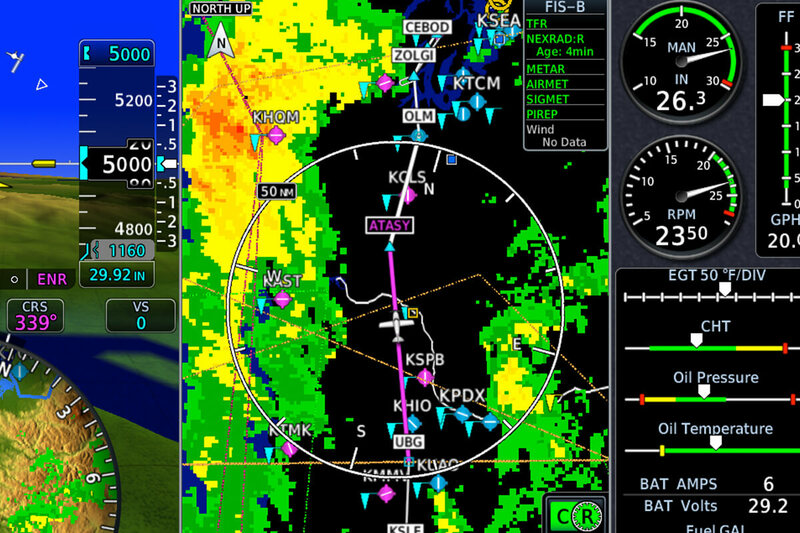 Track Weather Wherever A wide range of available weather solutions can be displayed on your TXi series touchscreens — including animated NEXRAD imagery from various satellite or ADS-B ground network links. Wire-strike Avoidance Our WireAware™ technology combines with optional HTAWS (Helicopter Terrain Awareness and Warning System) data to provide a comprehensive wire-strike avoidance solution that identifies hazardous obstacle transmission (HOT) lines for the U.S. as well as some locations in Canada and Mexico. Video Inputs Providing multiple inputs for optional video display, the TXi series supports a variety of camera configurations and locations — enabling the MFD to function as a monitor for FLIR, tail-cam or other live video. 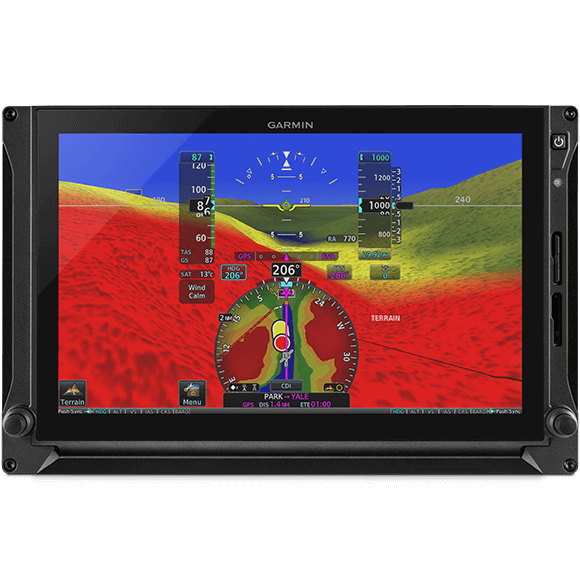 An MFD in Your HSI With navigation inputs, the TXI series can put an MFD-like perspective map view within the HSI portion of your PFD. This HSI map can incorporate NEXRAD imagery and weather data as well as SafeTaxi® diagrams, traffic, terrain alerting and more. Dynamic Mapping TXi dynamically draws moving maps with airspace boundaries, navaids, flight plan routings, terrain features, cities, airports and more, overlaying the aircraft’s position on top so it’s easy to understand what matters most. 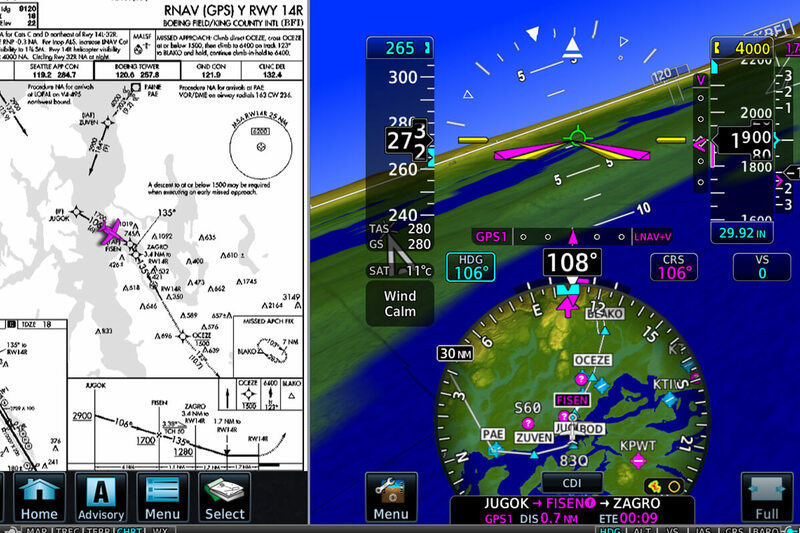 Terminal Charts The FliteCharts® database or optional Jeppesen® ChartView™ version can provide georeferenced approach plates and procedures on the TXi displays, giving a pilot the ability to view either format at any time during the flight. Advanced Traffic Display TXi displays integrate with a variety of traffic alerting technologies — everything from ADS-B “In” network traffic links with TerminalTraffic™ airport surface monitoring to our patented TargetTrend™ relative motion technology and active traffic surveillance systems. 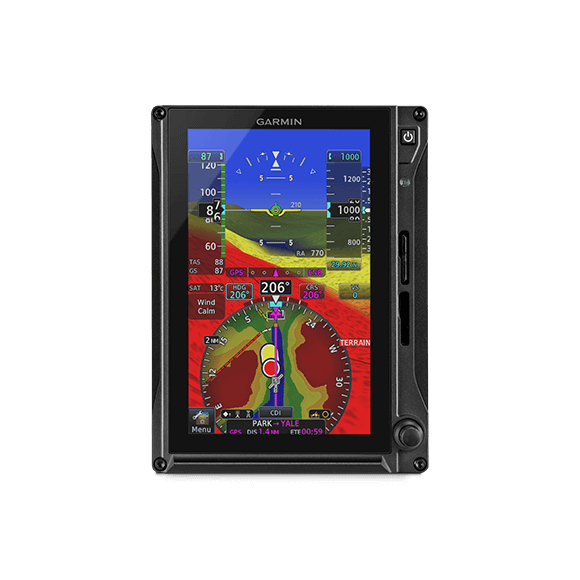 The icon-based menus and touch-control interface of the TXi displays are similar to our other products, especially the GTN™ 650/750 series navigators and our Garmin Pilot™ app for mobile devices. Together they provide full touchscreen continuity between the navigation, communication and flight display functions in your aircraft. 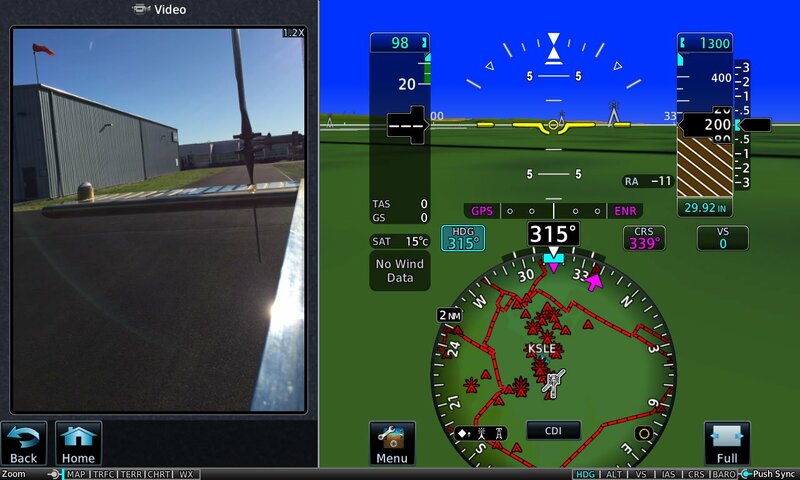 A Flight Stream 510 wireless gateway can provide even more connectivity between your avionics and compatible mobile devices running the Garmin Pilot, ForeFlight or FltPlan Go apps. Upload flight plans. Sync databases. Stream weather, traffic, EIS data and more. Turn your tablet or smartphone into a true cockpit interface. 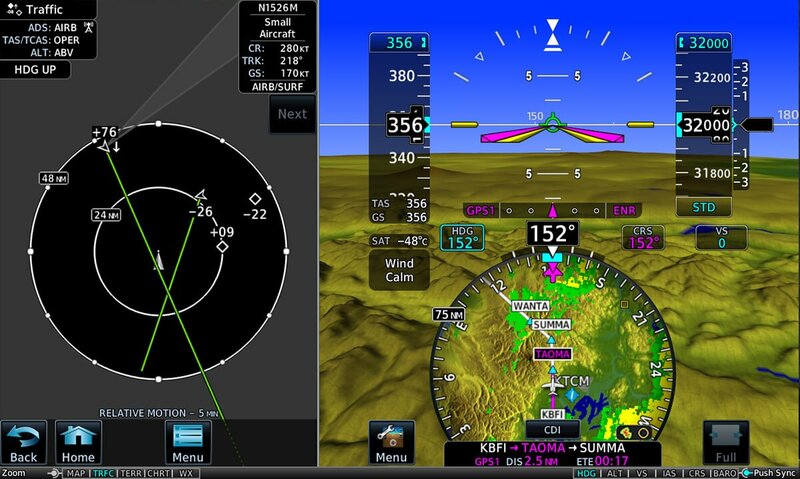 TXi was designed to interface with a wide range of avionics and autopilot systems. We've invested heavily in test equipment and certifications to ensure our system will accommodate most popular brands of GA equipment. 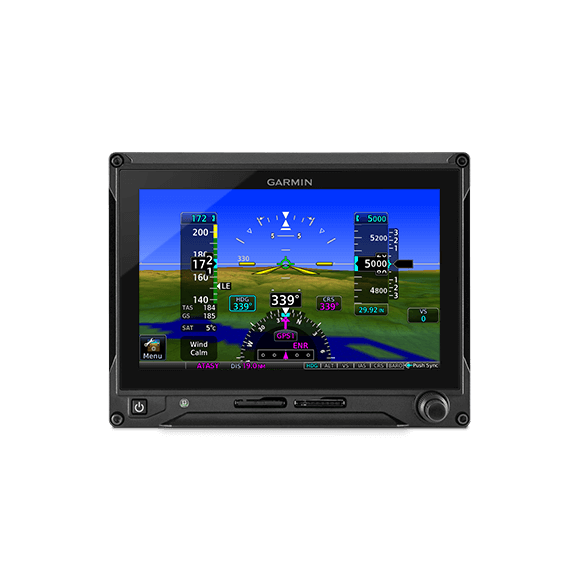 Aircraft owners who install G500 TXi dual 7” portrait displays with dual ADAHRS and our optional backup battery can forego the requirement for standby flight instruments in their light aircraft panels (Class 1 and 2 aircraft less than 6,000 lbs max takeoff weight). The all-glass cockpit is now a reality with TXi. Offering significant pilot workload reduction for helicopter operations, the TXi series is compatible with our GFC™ 600H flight control system. This system supports automated digital features such as Helicopter Electronic Stability and Protection (H-ESP™), stability augmentation system (SAS), hover assist, automatic return-to-level (LVL) mode, flight director (FD) command cues and more. 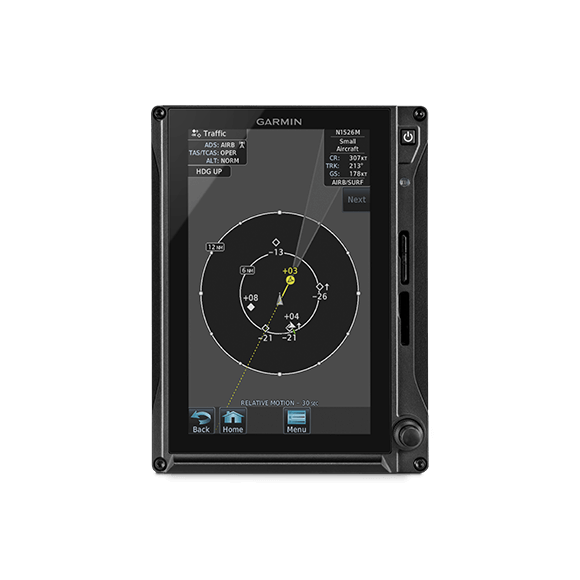 The icon-based menus and touch-control interface of the TXi displays are similar to our other products, especially the GTN™ 650/750 series navigators and our Garmin Pilot™ app for mobile devices. Together, they provide full touchscreen continuity between the navigation, communication and flight display functions in your aircraft. A Flight Stream 510 wireless gateway can provide even more connectivity between your avionics and compatible mobile devices running the Garmin Pilot™, ForeFlight or FltPlan Go apps. Sync databases. Stream weather, traffic and more. Turn your tablet or smartphone into a true cockpit interface. 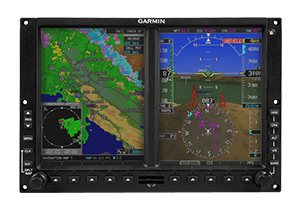 For owners of earlier-generation G500H flight displays who want to move up to the latest and best, full TXi compatibility with existing system sensors makes for an easy, cost-effective replacement/upgrade path. TXi was designed to interface with a range of avionics and autopilot systems typically found in business or commercial aircraft. 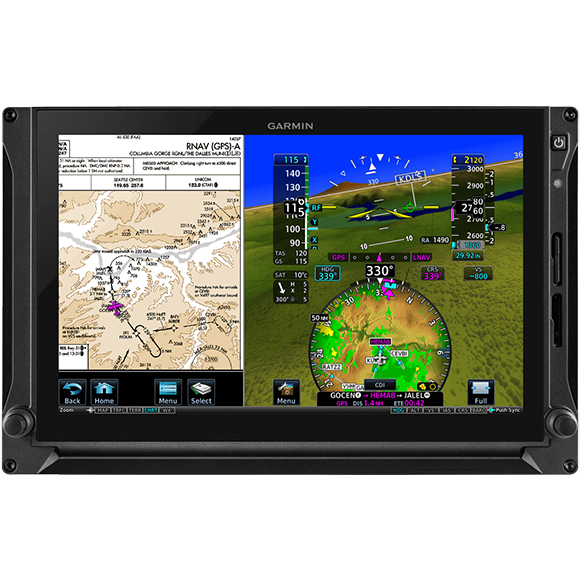 Certified for light piston singles and twins (Class 1 and 2 Part 23 aircraft weighing less than 6,000 lbs), G500 TXi provides a cost-effective, feature-rich glass touchscreen suite that’s approved for hundreds of popular general aviation makes and models. 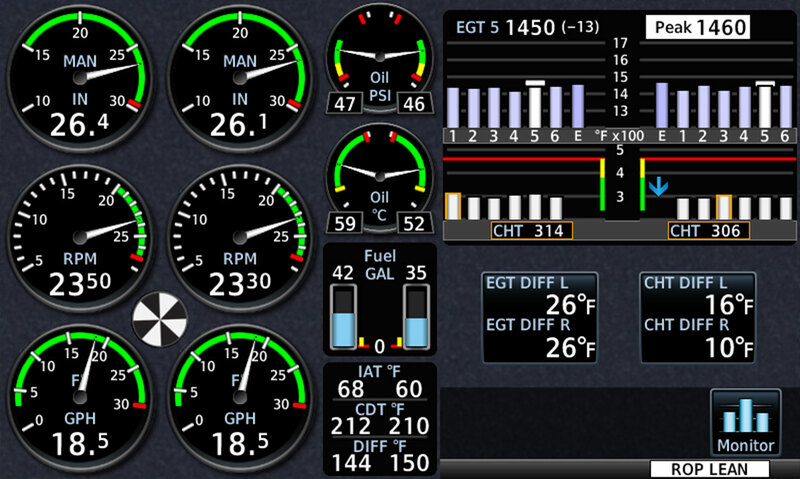 With TXi engine monitoring, it’s easy to see and analyze the critical engine, fuel and electrical parameters that can help you maintain the best, most efficient performance from your aircraft. 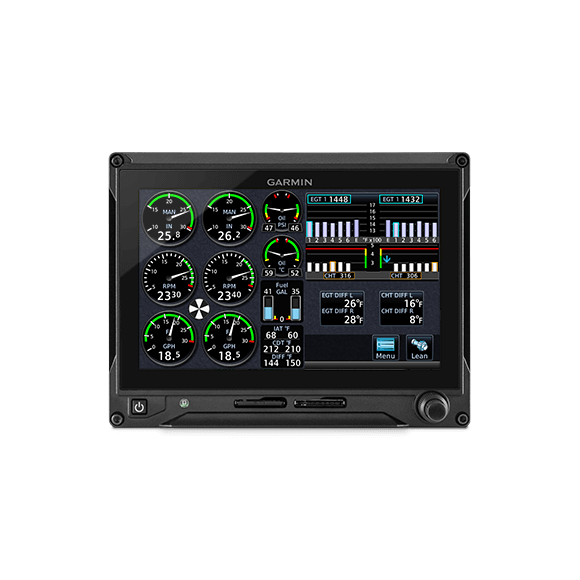 Data can be viewed as an integrated EIS strip on the split-screen 10.6” TXi display — or as a dedicated stand-alone 7” portrait or landscape engine gauge display. 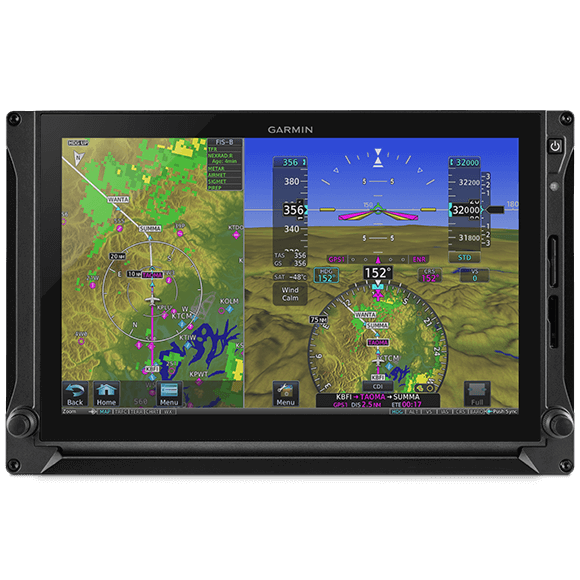 Designed specifically for FAR Part 27 helicopters, G500H TXi series displays — available in 7" or 10.6" formats — offer a variety of installation configurations and options to fit your mission, your panel and your budget. 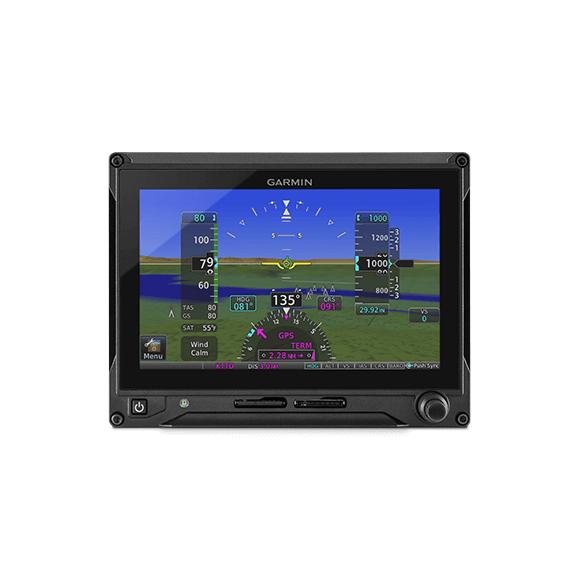 No other leading avionics manufacturer offers such breadth of capability — or such versatile configurability — in its lineup of glass flight displays for helicopters. 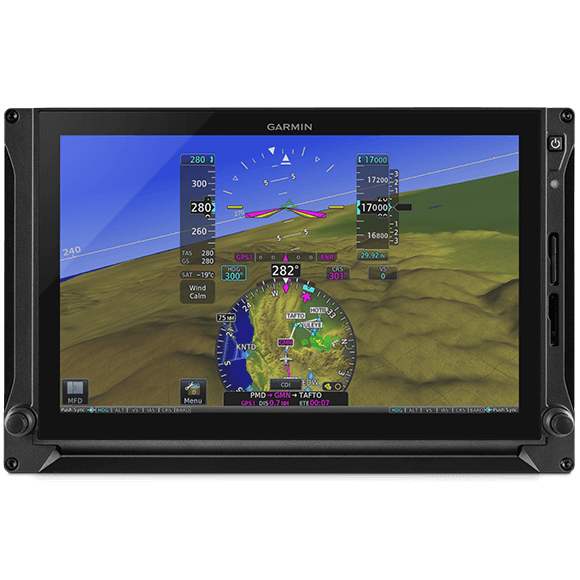 Specifically designed for FAR Part 23 Class 4 and FAR Part 25 aircraft, our G700 TXi touchscreen flight displays integrate with our GTN™ 750/650 series of all-in-one GPS/NAV/COMM/MFD avionics to bring a world of capability to your flight deck. 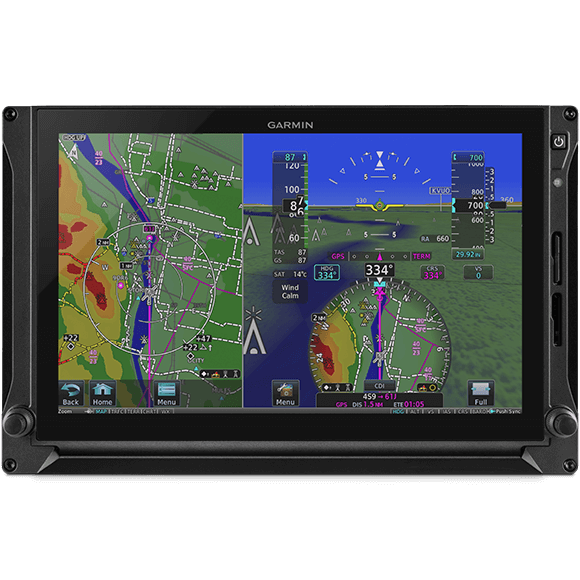 Featuring flight management system (FMS) capabilities, the GTN/G700 TXi pairing integrates all primary flight, navigation, weather, terrain, traffic and radio frequency readouts in a format that makes the pilot interface much clearer, simpler and more intuitive. 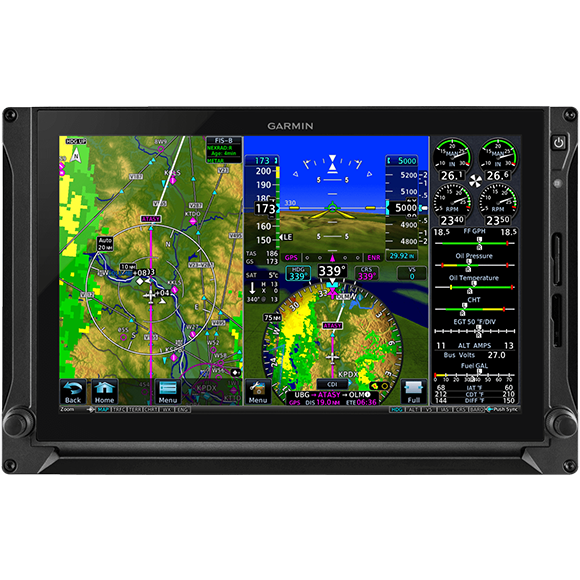 The Garmin TXi family of touchscreen flight displays gives you an amazing array of options for configuring a glass cockpit system in your aircraft. To learn more, we invite you to visit a Garmin dealer, enroll in a Garmin webinar or attend an in-person seminar hosted by your local Garmin dealer. And to familiarize yourself with the system, there are also free trainer applications for iPad® mobile digital devices and Windows® devices. Enroll in a webinar or an in-person seminar at your local Garmin dealer to get an overview of the system and learn about the latest features. As a bonus just for attending, our in-person seminars typically offer generous incentives on Garmin products. 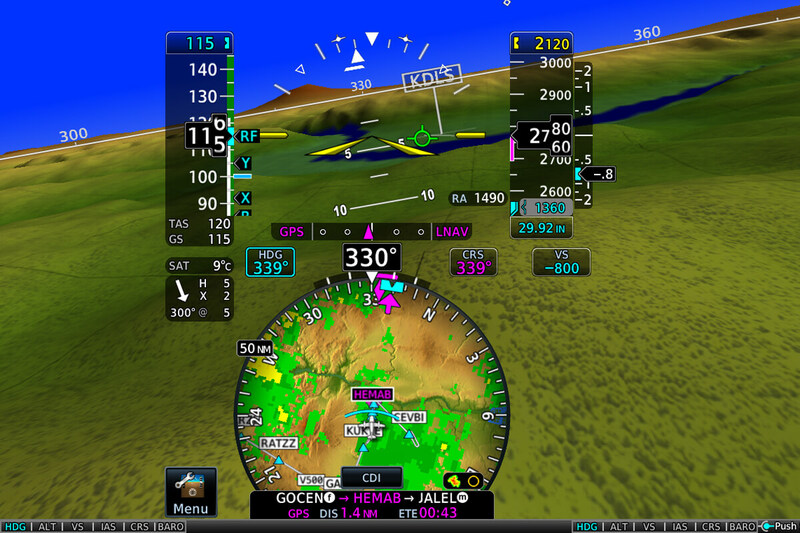 Download the free TXi Trainer app for iPad from the App Store® — or download the PC Trainer from Garmin.com — and explore how intuitive touchscreen flight displays can be. Backed by a comprehensive warranty and the industry's NO. 1-rated product support team, with this investment, you'll be flying with total peace of mind. And with the included online training course and available classroom courses, you’ll have the confidence to maximize your system’s capabilities from the beginning. 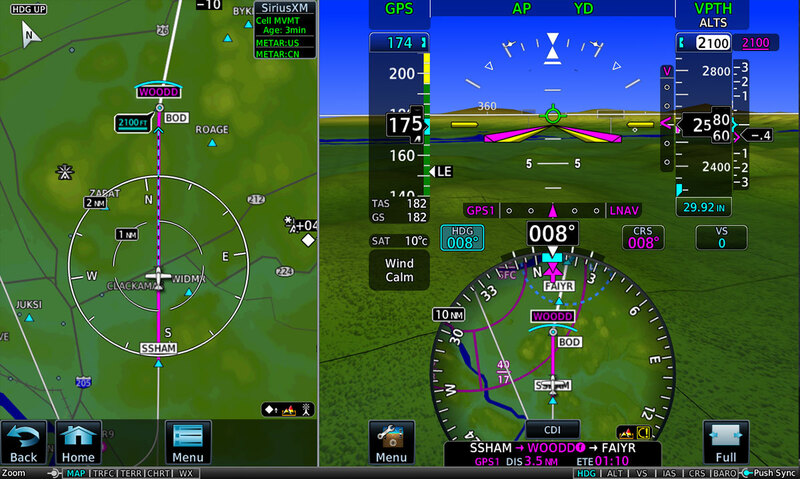 The TXi family of touchscreen flight displays gives you an amazing array of options for configuring a glass cockpit system in your aircraft. 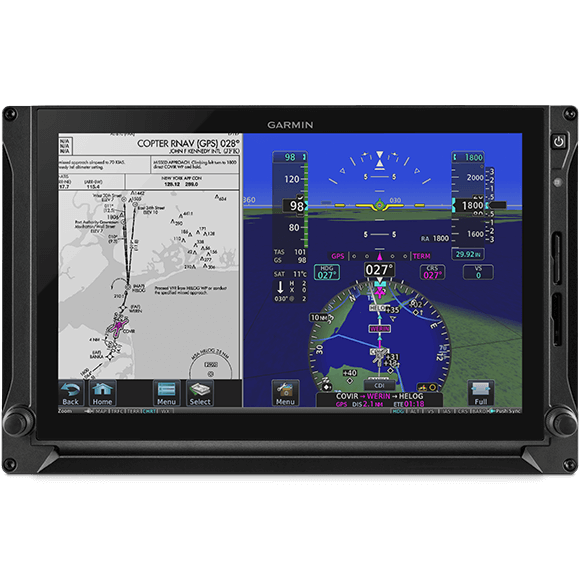 Available through a growing network of authorized installation centers, our G700 TXi flight display upgrade offers the latest in safety and pilot awareness features — as well as built-in growth capability for others yet to come. To speak with a member of our business and commercial aviation sales team, please contact [email protected]. 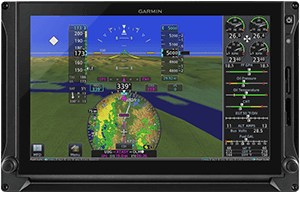 Download the free TXi Trainer app for iPad® from the App Store® — or download the PC Trainer from Garmin.com — and explore how intuitive touchscreen flight displays can be. Jeppesen® is a registered trademark of Jeppesen Sanderson, Inc. its subsidiaries or affiliated companies. Stormscope® is a registered trademark of L-3 Communications. Windows is a trademark of Microsoft® Corporation.